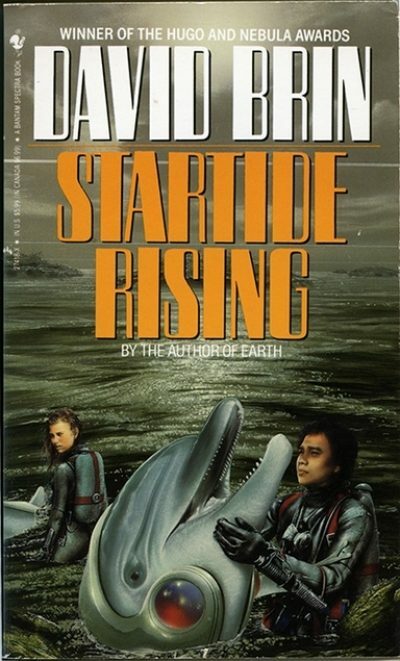 1983’s Startide Rising is the second novel set in David Brin’s Uplift universe. It is also a standalone. Unlike every other intelligent species in the known universe, humanity has no Patron responsible from raising it from animal cunning to true intelligence. Humans believe that they evolved naturally. The other species believe that humans are wolflings, created and then abandoned by unknown Patrons. Humans are also outliers in their insistence on using their own ingenuity wherever possible, rather than relying (as does everyone else) on the all-knowing Library. Tsk tsk. Humans are clearly upstarts who do not understand and accept their lowly place in Galactic society. The Terran starship Streaker, carrying a mixed crew of genetically engineered cetaceans and humans, stumbles across something unexpected, something utterly absent from the Library’s all-knowing databanks. Out in deep space, they find a fleet of ancient moon-sized ships (ancient but still somewhat functional). These ships may date from the days of the vanished Progenitors. It’s a find of immense importance. It’s just plain wrong that it should have been discovered by the lowly humans. Other species demand the co-ordinates of the find. Earth headquarters advises the Streaker to flee rather than give up the info. It finds itself on the run from several alien fleets intent on capturing the ship and seizing the co-ordinates. A damaged Streaker takes refuge on the fallow world Kithrup. The crew hope to repair their ship before their hunters pounce. But the alien ships arrive while Streaker is still planet-bound. The new arrivals fall to fighting among themselves, giving the Streaker more time to effect repairs. Will it be enough? Another Jim Burns cover! Burns is going to reappear over and over in Big Hair Big Guns! The actual cover is more vibrant but this was the best scan that I could find. It’s a genre trope in several genres: Asian civilizations are static, doomed to be superseded by energetic European (and American) societies. White racism rah rah rah! The Uplift setting recycles this trope on an epic scale. The Progenitors (whether on purpose or not) established a way of life that has been stable (without any significant progress) for billions of years. The humans and their uplifted client races (cetaceans, primates) challenge this stability. Not that humans have rejected all the customs of the galactic community. While they make gestures of permitting some degree of participation in government, the created races live on the sufferance of the humans. The failures (as assessed by the humans) won’t be allowed to reproduce; nor will their relatives. Just like breeding domestic animals. It’s an arrangement with which I imagine Duncan Campbell Scott would have been comfortable. So, not a setting that you would expect me to accept. Nor do I. It’s repugnant. The prose: it’s readable without being remarkable. The characters: they’re perfectly functional for space opera. The plot: the story starts in media res. The Streaker has found the great treasure and the great chase has begun. (Brin used the media res ploy in another book in the series, Sundiver, leading some readers to think that there was a prequel to that book that they had somehow missed.) It’s a good hook. Pick up this novel in a bookstore, check out the beginning, and you might just want to keep reading. This ploy also means that the book can be a little shorter than it might otherwise be, which in the case of this nearly-five-hundred-page brick is probably for the best1. I read this novel while working as a security guard at a factory experiencing labour unrest. In fact, I was the replacement guard aka strikebreaker. It was hinted that I might expect to be ambushed and beaten by the resisting masses2. Hence, every time I put down the book to do my solitary rounds3, I wondered if I would return to my reading or if I would be in an ambulance on the way to emergency. This uncertainty enhanced the narrative suspense already created by the tale. However, I’m not sure that I would recommend the experience to others. This was a popular novel. It place first in Locus’ best-novel poll and won both the Hugo and the Nebula. Not bad for a second novel. No surprise Brin became, with Benford and Bear, one of the so-called Killer B’s of the 1980s. Startide Rising is available here (Amazon), here (Amazon.ca) and here (Chapters-Indigo). 1: For some reason the hardcover edition I read in the olden times does not seem to be documented on the ISFDB. False memory? 2: This was the second stupidest decision… no, third stupidest decision I made when working as a security guard. Not as dumb as agreeing to work security in a hospital during Oktoberfest. Not as dumb as considerately breaking off a long icicle so it would not fall on anyone (me being the guy standing under the heavy, meters-long, pointy icicle). 3: There was a second guard but he flat-out refused to leave the office. Your Amazon jumps do not seem to be working. I do not think that I have ever read this book. I think I have fixed the issue. Yes, the jumps work now. Thanks ! I remember the hardcover edition as well, perhaps a library edition?